Steam has begun to offer localised prices to buyers in Europe. “The future is now” according to Valve, and indeed in the UK many prices have fallen below past RRP watersheds. But in the Eurozone prices have rocketed thanks to Valve’s conversion of $1 to €1, despite the dollar’s actual worth of €0.72. A dystopian future at best, this 28% increase is offset slightly by the inclusion of VAT in listed prices, though even the unusually large levies of 25% in Denmark and Sweden don’t account for the entire hike. Valve haven’t given any particular reason for the move, but there are several potential triggers. 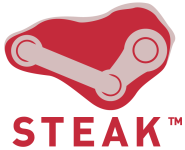 Foremost is the likelihood that Steam’s sales have simply reached a volume at which it becomes economic to flex some financial muscles: Newell predicted in May this year that Steam would start to account for the majority of Valve’s sales over the summer. Good Old Games also deserve mention for introducing a $6 price point for over half their catalogue, which has significant overlap with Steam (Valve’s equivalent price is £3/€5). Valve may feel that gamers ought to be shielded from the world’s increasingly unstable exchange rates, or perhaps it’s as simple as that the new code was checked in for testing? Speculation isn’t going to achieve much, so let’s take a look at the actual figures. Highlights can be seen to the right: most games have been automatically converted, but Valve also gave clients the opportunity to set their own prices and quite a few have taken the offer up. Some of the resulting reductions are incredible, particularly those given to FlatOut , Bioshock and Civilization III — FlatOut in particular, which is now far, far cheaper on Steam than it is at most retail outlets, even though it was released to solid review scores in August. But note Empire: Total War and World of Goo , which both went up in price all over Europe. 2D Boy’s defence of Goo’s prices is unsurprising: “our agreement with our European retail publisher obligates us not to undercut retail prices,” Ron Carmel told me. “No publisher would sign a retail deal without ensuring that.” Sega’s excuse is almost certainly the same. There’s a pretty obvious trend here. France and continental Europe as a whole has suffered, while the UK stands alone in benefiting. Posters on the Steam forums believe that this places “Valv€” in breach of EU anti-competition law (specifically Article 82), and they may well be right, though precisely where the buck would stop in that situation is a murky matter I don’t much care to tackle. It’s not hard to imagine how localised, tax-inclusive pricing became a bad thing for most. Artificial inflation of Steam prices is the last manifestation of that legacy bottleneck known as retail, and I’m actually quite surprised that any one region has been able to escape it at all. Indeed the UK may prove to be an experiment (Valve are working on “fixing” prices elsewhere in Europe), one made expedient by our continuing use of a separate currency. It’s certainly hard to imagine Amazon UK agreeing to Steam undercutting them on most games; they’ve discounted many since Valve’s new prices came in, but none very far. Postage and packaging typically undo their efforts unless the customer buys in bulk. Whether this supposed experiment will spread clearly depends on its reception in the UK, from both buyers and retailers. Alas we are unlikely to ever hear retailer’s reactions, save for sugar-coated assurances from their PR departments, and Steam’s top seller list is international. But with classics like Arx Fatalis and Civ3 selling for £3 it’s well worth spending less than the cost of a takeaway making a statement in favour. Not to mention picking up some great games! The Problem is, that the not only do not go below retail prices (what I would understand) but they are still 100% and more OVER the lowest retail prices (non special offers! regular pricing). Bioshock is available EVERYWHERE for 10Euro in germany. Still they charge 20 on steam. And you don’t even get a cd/box for this. The steelbox edition of bioshock goes for this price here! Even the uncensored, imported version of Bioshock runs for < 20 Euro! This pricing scheme is just a punch in european customers faces. It will teach me not to but from steam but rather go retail… Prince of Persia is said to not include copy protection so I might give it a chance to show that I really DO support game makers and that pirating IS caused by copy protection. Digital Distribution Review » The Steam Review Closing?